This chapter introduces and discusses the concepts that are in-depth articulated in the volume. International migration is presented here as a test bench where the normative limits of institutional order, its contradictions and internal tensions are examined. Migrations allows to call into question classical political categories and models. 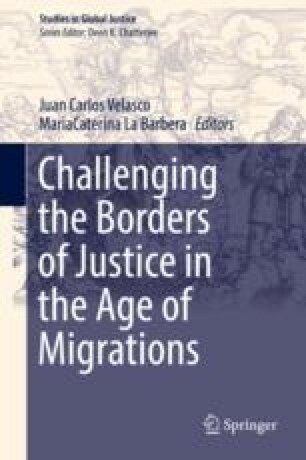 Pointing at walls and fences as tools that reproduce enormous inequalities within the globalized neo-liberal system, this chapter presents the conceptual tensions and contradictions between migration policies and global justice. We challenge the conceptualization of justice as a relationship between citizens of the same country and the State and argue that, in our globalized world, nation-state cannot constitute the basic unit of the theories of justice. We argue that an integral approach that includes the complex and interconnected forms of structural inequalities and transcends the borders of national sovereign states is required. Avoiding the methodological nationalism and the exclusionary biases that inform current migration and border control policies, this chapter finally places attention on the most marginalized subjects of the migration chain: migrant women workers. We point out the importance of addressing transnational structural inequalities and bringing social reproduction to the center of global justice theories. This work has been supported by the R&D grant “Human rights and global justice in the context of international migrations” (FFI2013-42521-P) funded by the Spanish Program for the Promotion of Scientific and Technical Research for Excellence. We especially thank Francisco Blanco and Astrid Wagner for their engagement and collaboration in this book project. Al Gore. 2007. Nobel Prize Acceptance Speech. https://web.archive.org/web/20101205052603/ http://blog.algore.com/2007/12/. Last accessed in June 2018. ILO, International Labour Organization. 2016. Migrant Domestic Workers. International Labour Office: Geneva, http://www.ilo.org/wcmsp5/groups/public/%2D%2D-ed_protect/%2D%2D-protrav/%2D%2D-migrant/documents/briefingnote/wcms_467720.pdf. Last accessed in Mar 2018. OECD, Organization for Economic Cooperation and Development. 2015. In It Together: Why Less Inequality Benefits All. Overview of Inequality Trends, Key Findings and Policy Directions. París: OCDE. https://doi.org/10.1787/9789264235120-en. UN-DESA, United Nation Department of Economic and Social Affairs. 2017. International Migration Report 2017. New York: United Nations. http://www.un.org/en/development/desa/population/migration/publications/migrationreport/docs/MigrationReport2017.pdf. Last accessed in 17 Jan 2018. UNDP, United Nation Development Programme. 2009. Human Development Report 2009: Overcoming Barriers: Human Mobility and Development. New York: United Nations. http://hdr.undp.org/sites/default/files/reports/269/hdr_2009_en_complete.pdf. Last accessed in Nov 2017.